You are here: Home / Cat Breeds / Burmese vs Siamese – We Make Choosing Easy! 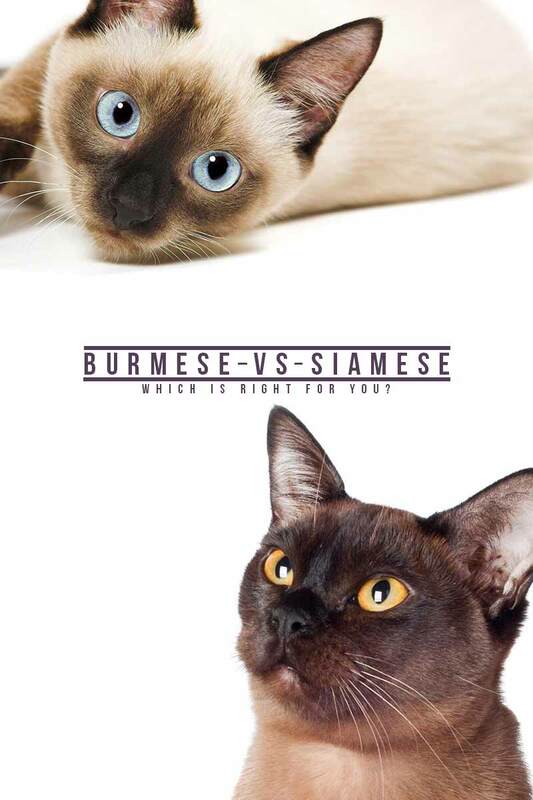 Burmese vs Siamese – We Make Choosing Easy! Tanya Clark pits Burmese vs Siamese to help you choose between these alluring and exotic breeds. 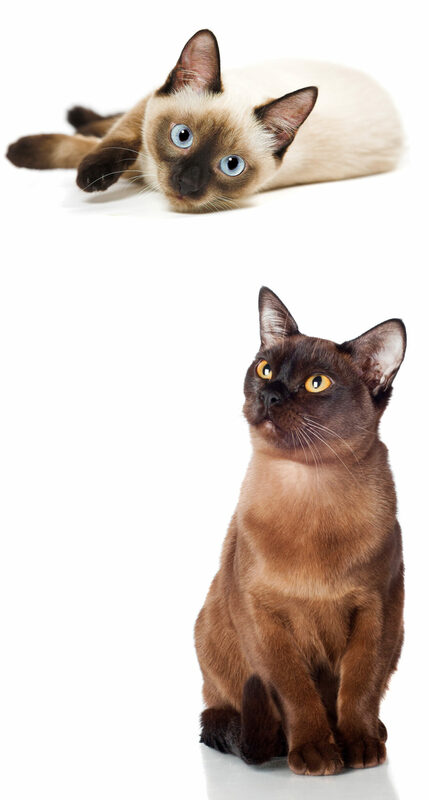 Siamese and Burmese cats have enough in common that it is not unusual to be conflicted over which one to choose. But if you are a cat lover, this is not a particularly bad problem to have! 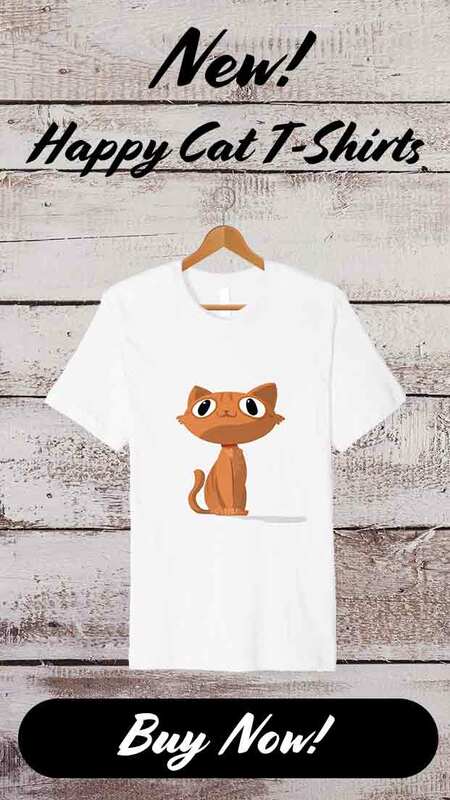 Think of it: two intelligent, animated, affectionate cats, each with their own unique traits and attributes and the only problem you have is deciding which one to bring home! Both breeds originated in Asia and have a demonstrative, people-oriented personality. Each is stunning in appearance, and we will review the current physical condition of each breed. If you can only choose one cat, Siamese or Burmese, we’re here to help you make an educated decision based on health, personality, lifespan and coloration. 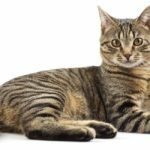 Before we delve into the finer points associated with each breed, let’s take a look at the backgrounds of these popular, beautifully distinctive cats. Oftentimes the history of a cat breed is shrouded in the mists of time, but this is definitely not the case for the Burmese. These felines are one of the oldest known breeds, appearing in the written record as back as the 14th century. Named for their country of origin, Burma (now Myanmar), these sturdy, muscular kitties were bred by Buddhist monks and allowed to roam free throughout their ancient temples. The monks no doubt found a kindred spirit amongst these caring, gentle cats who loved to be in the company of humans. Their compact physique certainly didn’t hurt the ancient Burmese’s popularity either; with their small frames, these cats would have been easily accommodated with the confines of the temple. Over time Burmese cats were bred with a focus on highlighting their social, people-oriented outlook, which has resulted in a modern feline that forms strong attachments and prefers to be with its human rather than being solitary. All Burmese cats can be traced back to a now rather infamous brown cat from Burma, Wong Mau. This moggie came to the US circa 1930. She was then mated by a breeder with a Siamese cat, and voila, the Burmese breed was born. Isn’t it curious how sometimes remarkably random events lead to the most wondrous discoveries? The Cat Fanciers Association fully recognized the breed in 1957. Native to Thailand, the first written record of the Siamese cat may date as far back as the 14th century. The Asian cat came to U.S. shores in the late 1880’s as a gift to the wife of President Rutherford B. Hayes. It didn’t take long for this unique and exotic looking feline to be embraced by the public, and by 1906 they were formally recognized by the Cat Fancier’s Association. Compared to today’s sleek physique, much chubbier Siamese cats can be seen in artwork of the 18th century. However, around the 1960’s the breed was deliberately bred to have the distinctive appearance we recognize today: a thin body, triangular shaped head, long tapered tail, and oblong eyes. Let’s start comparing Siamese and Burmese cats with the first thing you notice – the color and pattern of their coat. Siamese are famous for their vivid color point coats. What is a pointed coat pattern? 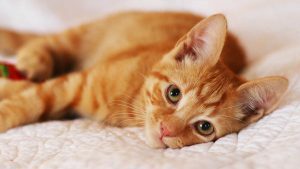 This technical term refers to a fur configuration that is lighter in color on the body than it is on the “tips” or points of the cat, such as his tail, feet, nose, and ears. The official color point pattern names for Siamese are: Chocolate Point, Seal Point, Blue Point and Lilac Point. Chocolate Point bodies appear creamy with pale brown tips, Seal Points are tan with dark brown marks, Blue Points are white with gray points, and Lilac Points features a cream colored body with a pink cast to the tips. How do Burmese colors compare? Meanwhile, Burmese have faded, if any, color points. The Cat Fancier’s Association outlines four official Burmese colors as follows: Blue (lilac), Champagne (light brown), Platinum, and Sable. The latter two are a light silver-gray and dark brown, respectively. The deep sable brown is uniquely dark, while the other colors are much more faded or dilute. Did you know eye color is also influenced by melanin, the pigment that is also responsible for skin and hair color? Point-type fur patterning is actually considered a form of albinism – a hereditary inability to produce the pigment melanin.. In fact Siamese kittens are born all-white, with their eventual fur color and darker points evolving with age. This means Siamese cats always have blue eyes, another expression of their natural lack of pigmentation. Conversely, Burmese kitties are able to produce melanin in greater quantities, and have exclusively yellow or golden eyes. If you have ever crossed paths with a Siamese, chances are you had a conversation. Talkativeness is one of the signature hallmarks of this breed! The Siamese possesses an impressive kitty vocabulary, made up of distinctive feline sounds including an insistent, loud meow that some compare to a baby’s cry. If you want a calm, quiet household, think twice before bringing a Siamese home! The Siamese cat personality has been variously described as needy or demanding – I prefer to think of their demeanor as one in which the Siamese simply enjoys being the life of the party! They remain intrigued by the events going on around them even as mature cats, and many owners opt for a pair of Siamese due to their dislike of solitude. Siamese are a people-cat and owners can expect to be adopted for life by their Siamese kitty. If this personality description sounds more canine than feline, you’re right. Burmese vs Siamese – How does Burmese personality compare? The Burmese breed is much like its Thai cousin in terms of outlook and personality. Like the Siamese, the Burmese want to be a part of whatever you are doing, and will not hesitate to use their voice to elicit your response. Burmese cats have a deeper, softer voice than Siamese, but they can be just as insistent when they crave your attention. Burmese cats are a playful type of feline, who naturally get along well with children and make a good family cat. Like the Siamese cat, Burmese kitties are not meant to be left to their own devices; they thrive when others pay attention to them and they have a reputation for bonding with their owners. They are quite nimble but Burmese cats know that their muscles exist for a reason and they like to show off their athleticism by jumping about; especially if you admire them while they do so! Overall the Siamese breed enjoys a relatively healthy medical profile in comparison to some other pedigree cats. Feline asthma is characterized by coughing, wheezing, and difficulty breathing. We don’t know what causes it yet, and whether it’s hereditary in Siamese cats, but it is certainly more common. Feline asthma is diagnosed by veterinary examination and sometimes x-ray. It can usually be managed effectively with steroid medications. Progressive Retinal Atrophy is an inherited eye condition which causes affected cats to gradually lose their sight. Luckily, a genetic test for carriers is widely available now, and breeders should test their breeding stock to protect future generations of Siamese. Hip dysplasia is a malformation of the hip joint which leads to painful arthritis and eventually lameness. Several factors can cause or exacerbate hip dysplasia, but we know it has a genetic component. 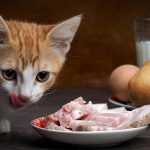 Cat breeders should know about any patterns of hip dysplasia in their cats’ ancestors and avoid breeding individuals likely to pass it onto to their kittens. Amyloidosis is a build up of protein in the kidney and liver which can eventually lead to organ failure. It is particularly common in Siamese cats, and we are part of the way to understanding how and why that is. But there’s some way to go, and your Siamese cat breeder should be happy to discuss previous diagnoses in a kitten’s family tree. Cancer is often a sad part of aging for all breeds of cats. Siamese cats appear to be particularly prone to mediastinal lymphoma and mast cell tumors, but happily at lower risk of squamous cell carcinomas. 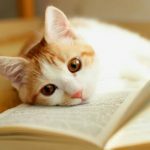 Burmese vs Siamese health: how do Burmese cats compare? What type of medical issues can a potential Burmese cat owner expect? Diabetes appears to be the major health issue associated with the Burmese breed. One study of insured cats found that Burmese cats were almost four times more likely to have diabetes than non-pedigree felines. They are also subject to hypokalemia. Hypokalemia is a disorder in which low levels of potassium in the blood leads to muscle weakness, and it is usually treatable with dietary potassium supplements. Luckily there is a genetic test for identifying carriers of the disease, so we can predict how kittens will be affected. Color point cats enjoy a bit of a reputation for being less prone to hyperthyroidism. In 2017 a team at the Royal Veterinary College in the UK set out to investigate this, and found no link between coat color and hyperthyroidism. But they did find that Siamese and Burmese cats are BOTH at decreased risk of hyperthyroidism compared to the average domestic shorthair (as are other Asian breed like the Abyssinian). We just don’t know why yet! It’s not uncommon for Siamese as well as Burmese cats to live up to 15 years and beyond. To give either breed the best possible shot at a long life, feed them a high quality diet, keep up to date with vet checks, vaccines, flea treatments and worming, and make lots of time to play with them and enrich their life with games and good company. It’s crucial to work with a responsible breeder if you choose either a Siamese vs Burmese breed. Ask to see the health certificates for your kitten and both of her parents. For Siamese cats, be sure to ask about the history of the inheritable conditions we discussed earlier. 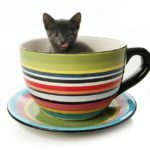 If you are considering a Burmese kitten, be sure to ask your breeder about hypokalemia, and the carrier status of their kittens’ parents. Siamese or Burmese… or a bit of both?? Before we end this comparison of Burmese vs Siamese cats, I would be remiss not to mention the Tonkinese breed. What does a third feline have to do with our Siamese or Burmese cat debate? Everything! Far from being a mixed breed, they have enjoyed their own pedigree status since the 1970. These unique cats display the active, intelligent nature of the Siamese and Burmese, but without the pronounced appearance of either. And they’re certainly worth consideration if you’re still sitting on the fence! 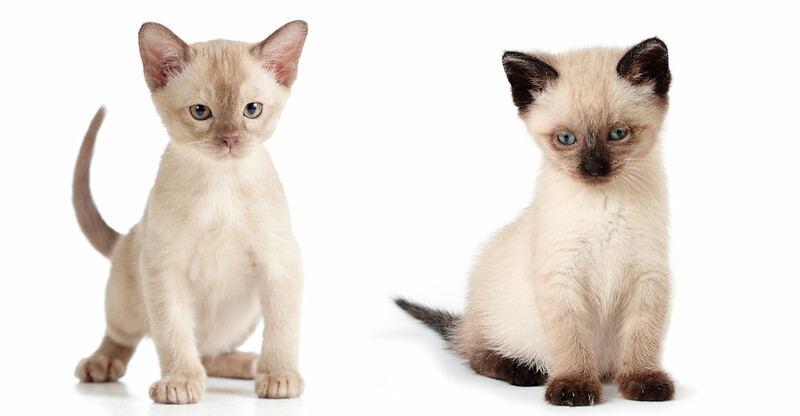 Siamese or Burmese – Which will you choose? Both breeds are chatty cats who will be your best buddy and keep you entertained. Both settle well into families with children, and neither like to be left alone for long periods. Siamese and Burmese cats are both formidably intelligent – many owners of these breeds describe successfully teaching their cats to fetch! Despite their numerous similarities, these pedigreed felines differ drastically in appearance. While the Burmese is a stocky, chunky little fellow, the delicate featured Siamese has a distinctly refined and graceful presence. Wherever you think your heart might lie, you can read more about the Burmese in our complete breed review here, and immerse yourself in all things Siamese right here. Burmese vs Siamese cats: which is the best fit for you? Have your already made your choice? Which breed did you choose, and what decided it for you? I have both! I have a 14year old Siamese, and a 14 year old Bermese. My Siamese is make and the Burmese is female. I also have an 11month old Siamese. Honestly both of these breeds are absolutely amazing and similar yet so different in a lot of ways! I rescued 2 siamese crosses when they was 14yrs old. Both from the same litter, both have the look of a siamese cat, with the tapered tails, triangular heads etc. But one is vocal (Bonnie), the other you could see her meow but it was always silent (Heidi) Both very needy. Both needing constant human attention. But the one with the silent meow (Heidi) died this year aged 19yrs. She had a tortoise shell colouring and looked a little odd being so slender with her features and came to me with kidney failure. I had her for 4.5 years. Her sibling has just turned 20 and has the traditional colouring of a siamese. Both loved to be outdoors mostly. And I feel pretty lucky to of had Heidi so long and I will be gutted when we lose Bonnie. We also have a younger tabby who is now 14yrs and I’ve had her the longest since she was 4yrs. She’s the most aggressive, moody cat ever. And is an indoor cat who likes her own company. Unless she’s wanting food. I love her (Misty) to bits but she dosnt greet you when you home like Bonnie does and like Heidi did. If your wanting a sociable cat always go for something like a siamese etc. Your traditional house cat isn’t very sociable. Love my moody Misty, my noisy Bonnie and miss my cuddly silent Heidi.